I started working in Wellington for Wang New Zealand, and divided my time between offices in Auckland and Wellington. 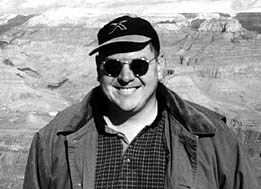 Occasionally I got to travel overseas, and here I am in front of the Grand Canyon, on my way to Las Vegas for Comdex Fall '97. After a stint as co-owner and director of graphic design agency Mision Hall I managed a group of companies working in New Zealand, Singapore and Dubai.